To be clear, MGP Ingredients (also referred to by many whiskey writers as LDI) owns and operates industrial production facilities in Atchison, Kansas and Lawrenceburg, Indiana. MGP Ingredients is a manufacturer of food and alcohol products. Their wheat extracts are used for protein enhanced processed food and drink products. Its industrial alcohol is used to make vinegar, flavorings, hand sanitizers, oral antiseptics, personal-care products, pharmaceutical products and household cleaning solutions. They also make whiskey and LOTS of it. They are the largest producer of gin and rye whiskey in the United States. They are also a major source of bourbon and vodkas as well. Please note that being a producer of chemicals and extracts does NOT make your company incapable of making excellent whiskey. On the contrary, it makes you a versatile and economically successful company. This type of company draws a lot of negative attention from modern whiskey drinkers, but their aggravation with MGP has more to do with a misunderstanding of American whiskey production (not to mention scotch and other international whiskies) than anything else. The production of whiskey has always been a diversified business both in the U.S. and abroad. The oldest distilleries were just part of the larger agricultural business that their owners ran. A farmer would take excess grain from their harvest and distill it into spirit. The harvest, in the 18th century when distilling was becoming profitable, was first and foremost on the agenda. That excess grain could be ground into flour, and larger farms built grist mills and imported mill stones to do just that. Whether the mill was run by wind or water wheel, it was grinding corn, wheat or rye (or all of them) for the farmer and often for the community, which paid a toll for its use. (A toll was a small portion of the grain that was taken by the miller.) A distillery was usually near a waterway which the miller would use for transporting goods to and from markets. Later, roads and train tracks were laid to supplement or replace canal and river transport. Coal and coke (coal product that is relatively free of smoke and impurities) became a good business expansion for a grain miller, who would need access to fuel sources for malting their grain. 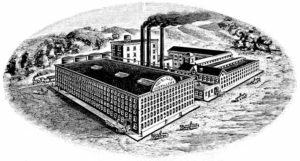 As distillers expanded their businesses, many not only owned large farms to grow grain, but also built malt houses to malt the grain that was being made into whiskey, mills to grind the grain, sold malt and flour, constructed lumber yards and lumber mills to make barrels, owned coal mines and coke ovens, and many became invested in transportation companies. These early distillers would become a large part of the Industrial Revolutions of the 19th and 20th centuries. If the farmer can so easily use the tools at their disposal to further other business opportunities, you can imagine how easy it was for distillers of whiskey to get involved in distilling industrial alcohol, making medicines and expanding their repertoires. 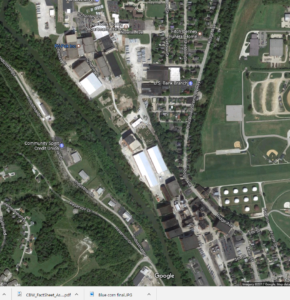 Aerial view of MGP in Lawrenceburg, Indiana. The buildings and warehouses line the Ohio River. The distillery in Lawrenceburg, Indiana, now known as MGP, is the modern iteration of a distillery that was built on that location in 1847. The mid to late 19th century was an era of distillery building across the northern states, especially in Pennsylvania. These distilleries grew and diversified. The money was invested in banks, coal, oil, steel, manufacturing, chemical companies, political campaigns, you name it! Many distilleries also produced chemicals and re-refined whiskey for industrial use. Samuel Bromfman and his company, Jo. E. Seagram & Sons, took ownership of the Lawrenceburg location in 1933 after Prohibition. Seagrams bought Rossville Distilling Company in 1933. Seagrams is a household name and the company diversified in everything from soda to oil and gas. As we’ve discussed, this is not a new phenomenon. The modern facility is a huge network of 92 buildings on 226 acres. It is one of the last distillery complexes that we would’ve recognized from before Prohibition (1920) and that are still very much a part of Canada’s distilling tradition. Diageo, itself a merger of many large companies, is today, the world’s second largest distiller, and is still MGP’s number one buyer. I think the distaste that many people have for MGP is that today, advertisers tell us that whiskey is a hand-made product with deep roots in tradition. Tell that to the distillers in Kentucky that produced industrial alcohol through WWI and WWII. The modern distilleries that we know and love for their products also do contract distilling for paying customers. Many have contracts to age their own product in barrels that are then shipped to Europe and elsewhere for re-use. Many buy bulk grains from corporate farms. You are often required to wear hardhats when you tour their facilities and are not invited to see their laboratories. We should not be surprised by the success of MGP. If it hadn’t been purchased by one of the “big four” companies after Prohibition, it likely would not be here today. Without this descendant of our industrial past, the bourbon boom and the rebirth of rye would not have been possible. Try to imagine what the present day would look like if the mega-distilleries of Pennsylvania, Ohio and Illinois were around to diversify with the changing times of the last century. What businesses would they have evolved into? What products would they be producing? Would we still be thinking that MGP is an interloper in modern whiskey production? I think not. 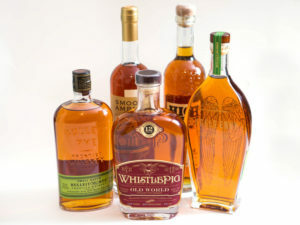 These are examples of highly rated whiskeys that are distilled by MGP. Some are aged for additional time in various “finishing” barrels for a personal touch by the purchasing distillery.